shunice.com has merged with printingwales.com to offer the same quality of design but with the bonus of a complete cost effective printing service. 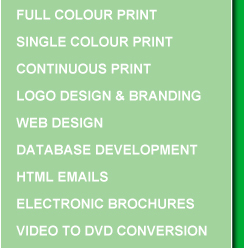 printingwales.com can take your ideas from a rough scribble on a peice of paper right through to a full marketing campaign. printingwales.com will continue to offer a video to dvd conversion service, we can convert VHS & 8mm tapes, be it your own personal home videos or corperate traning videos, we’ll make sure they can be viewed on the latest DVD players.